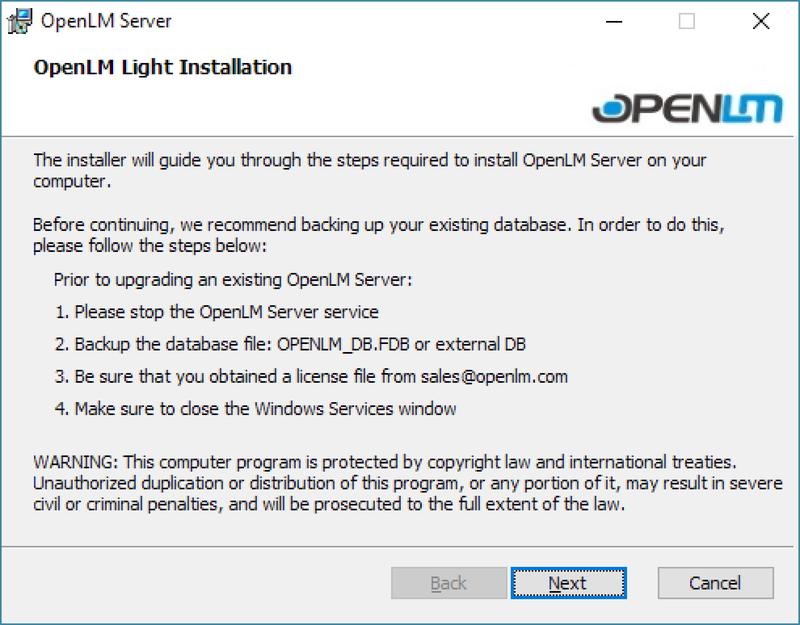 The following instructions will help you install OpenLM software for Light and Core versions and present offered options and advantages. Understanding installation process will allow you to choose proper options for your organization to best audit and manage engineering software licenses for optimal allocation of resources. OpenLM Light and OpenLM Core are intended for different needs. You need to choose correct option for installation in order to fully explore advantages of OpenLM for your business. Light version of the software is designed for small organizations and the Evaluation version for large organizations which require enterprise-level management. In most cases it may be advisable to use options for the 30-day trial of the Core version. Their differences and advantages are outlined below. * Core installation requires an upgrade before the 30-day trial expires to continue using the software seamlessly. If the trial license expires and becomes outdated, an ‘invalid license’ message appears on startup. To extend or renew licenses, contact sales or distributor (see “Upgrading to OpenLM Core and Obtaining Licenses”). Make sure you meet installation requirements for the software before attempting installation (see: https://www.openlm.com/openlm-system-requirements-2/). All organizations may want to consider the Core trial option to explore the full opportunities of using the more robust product. Obtain installation executable. It can be downloaded from the website (see: https://www.openlm.com/download/). After downloading, double-click the installer file. installation will begin automatically. Depending on the installer, “OpenLM Light Installation” or “OpenLM Core Installation” confirmation screen will appear. Please read the screen and note all options, including backing up any existing database before continuing. This is especially important if you have previously installed the software and want to continue using it without losing any work (e.g., in the case of upgrading to a new version). 3. Click [NEXT] to confirm installation. “License Agreement” screen will appear. Please read the license agreement. 4. When you have read the license agreement, click I AGREE and [NEXT] button will become available. You must ‘agree’ for the [NEXT] button to become active; if you do not agree your only option will be to use the [BACK] button to return to introduction screen or [CANCEL] to exit the installation. 5. Click [NEXT]. “Select Installation Folder” screen will appear. 6. Installation folder field will be populated with the default path for installation. You can use [BROWSE…] button to choose a new path. [DISC COST…] button allows you to evaluate the available space of current drive installation options. Unless there is a distinct reason to change the path, accept the default one by clicking [NEXT]. “Confirm Installation” screen will appear. 7. Click [NEXT] to accept installation and start installation process. “Installation in Progress” screen will appear. [Note: Security software may affect progress at this point if it has not been disabled for the installation]. 8. When the progress completes, “OpenLM Installation” screen will appear. 9. 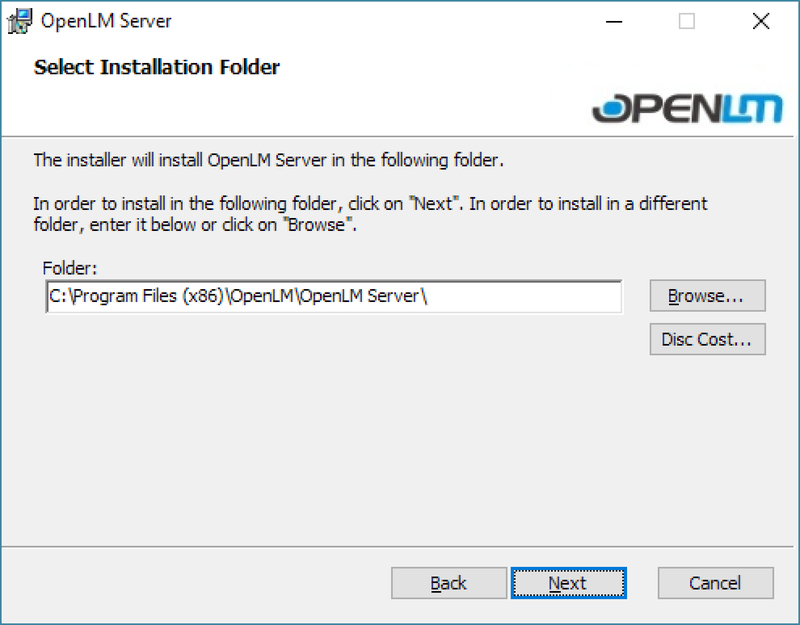 Two choices in OpenLM Installation initiate different installations. For the Light installation/upgrading choose right option [TRY LIGHT]. 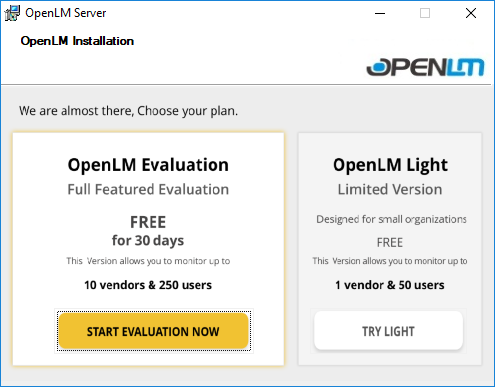 For the OpenLM Evaluation trial version click left option [START EVALUATION NOW]. When selection is made, “OpenLM License” screen will appear if this is a new installation. Please see the section on “OpenLM License” screen below (Section 9.A). If an existing valid license is present, that license will be used for validation and installation success screen will appear for the appropriate license. Please see section on “Installation Success” screens below (Section 9.B). Section 9.C Troubleshooting Installations explains potential reasons why installation may fail. 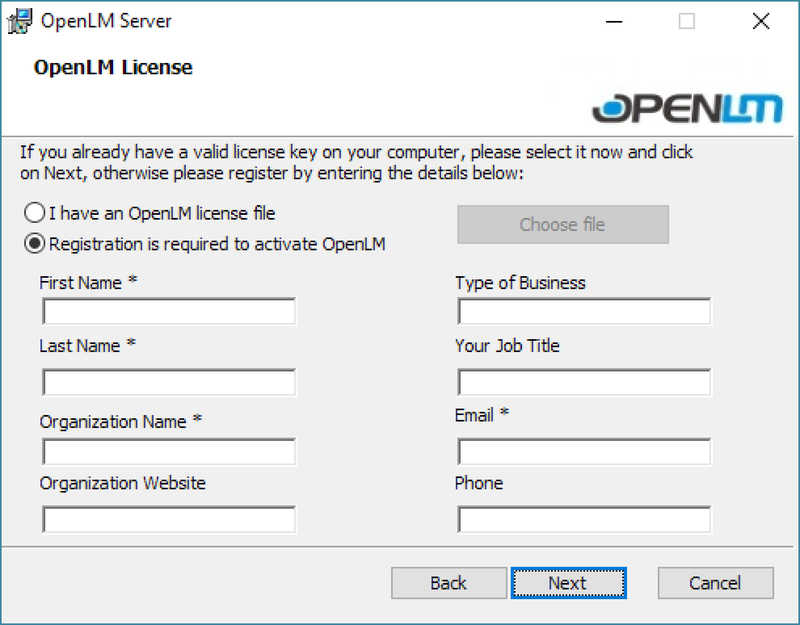 “OpenLM License” screen offers two options: I have an OpenLM License and Registration is required to activate OpenLM. To register for a new license, click on Registration is required to activate OpenLM (Section 9.A.1). To load an existing license, choose I have an OpenLM License (Section 9.A.2). Existing licenses will be supplied by OpenLM (please see “Upgrading to OpenLM Core and Obtaining Licenses”). 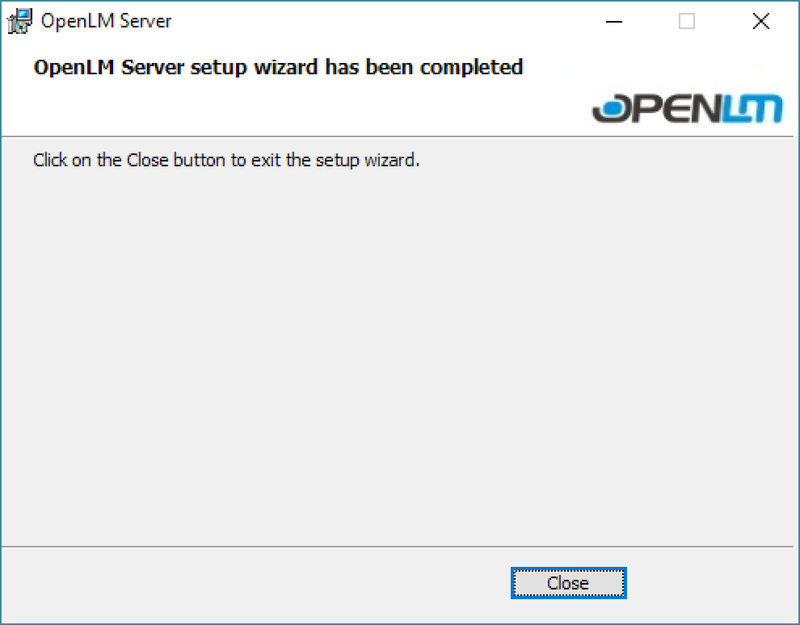 OpenLM License screen is displayed when Registration is required to activate OpenLM option is selected and either [Continue with OpenLM Light] or [Continue with OpenLM Evaluation] button is clicked. Fill in required fields. These fields are marked with an asterisk (*) and include First Name, Last Name, Organization Name and Email. Additional fields are optional. * First Name and Last Name fields can only contain letters, numbers, hyphens, underscores or spaces. * Organization names should contain only letters and numbers. * Email addresses should be valid and properly formed — no spaces, include an ‘@’ symbol and proper domain extension. Upon completion appropriate “Installation Success” screen will appear. See section 9.B Installation Success Screens. Users with a valid license that they wish to use for installation should choose I have an OpenLM License option. If you are installing on a machine that does not have an Internet connection, you must obtain a license separately and execute installation using this option. After you select I have an OpenLM License option, [Choose File] button will become available. Click [Choose File] button to open an Explorer window and navigate to locate the license file(s) you want to load. When the file(s) is(are) located, click Select, then press [OPEN] button in the Explored window. This will return you to the “OpenLM License” screen, which will remain unfilled. Note that during selection, more than one license file can be selected. This comes into play when testing additional module functionality such as OpenLM Broker, OpenLM Agent, OpenLM Router, and OpenLM Scheduler. If you are loading more than one file, they need to be located in one folder. Click [NEXT] to complete installation. Note that the installer will take license files and place them appropriately in the OpenLM file structure. Depending on whether you chose to install the Core trial or the Light version of the software, “Installation Success” screen will have a different appearance, addressing specific concerns of version you have installed. See “9.B.1 The OpenLM Light Installation Success Screen” if installing Light version; see “B.2 The OpenLM Core Installation Success Screen” if installing Core trial version. 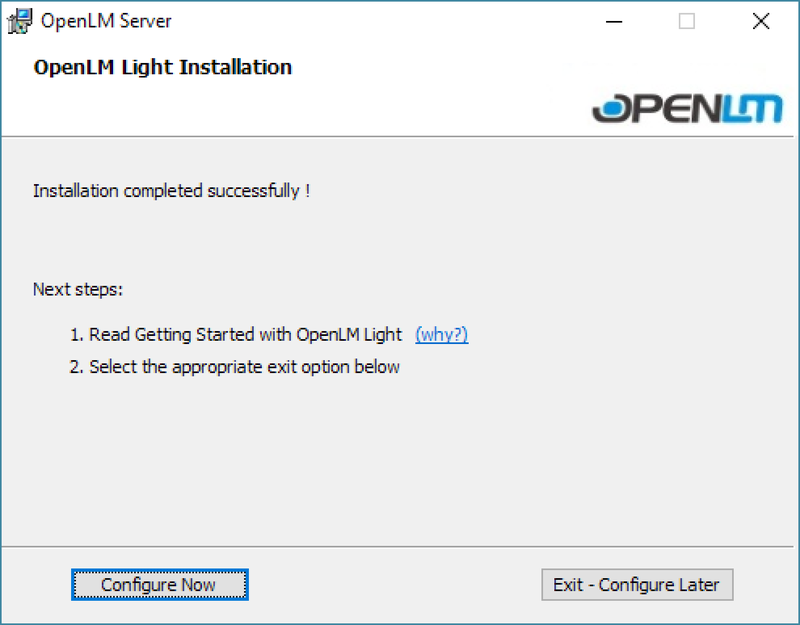 “OpenLM Light Installation” success screen confirms your successful installation of the Light version of the software and offers a link to helping you get started using the software. Clicking [WHY] link in the list of “Next Steps” is highly recommended for initiating a faster, more satisfactory experience with the software. The link leads to a web page that explains completing configuration. Note that you need a live internet connection to access the link and information. Clicking [Configure Now] will open “Configuration” screen. Clicking [Exit — Configure Later] will exit the installer. To access the Configuration module after exiting, choose Start > OpenLM > Configure OpenLM Server. To add server licenses, please see additional documentation to complete setup. “OpenLM Core Installation” success screen confirms your successful installation of Core version. It offers several options to help improve your experience with software. The first option under “Next Steps” to download and install OpenLM Broker is an option that is strongly suggested for Core users. Clicking [WHY] link brings users to a video which explains some of the details and advantages. Convenient links to [WINDOWS VERSION] and [LINUX VERSION] of OpenLM Broker are available on the screen. You must have an active Internet connection to access these downloads. Links will bring you to a registration form which enables an added level of service, but download can be completed without registration by scrolling down to “No, Thanks. Skip registration for now” option. Second suggestion is intended to help users get started using the software. Clicking [WHY] is highly recommended for having a faster, more satisfactory experience with software. The link leads to a web page that explains how to finish configuration. Note that you need a live Internet connection to access the information. 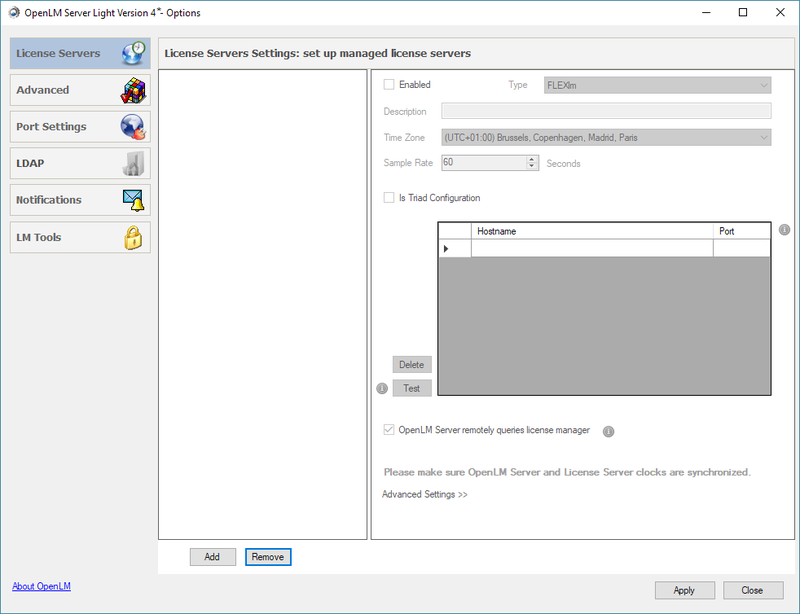 Clicking [Configure Now] will open “OpenLM Server Configuration” form. Clicking [Exit — Configure Later] will exit the installer. To access Configuration module after exiting, choose Start > OpenLM > Configure Open LM Server. 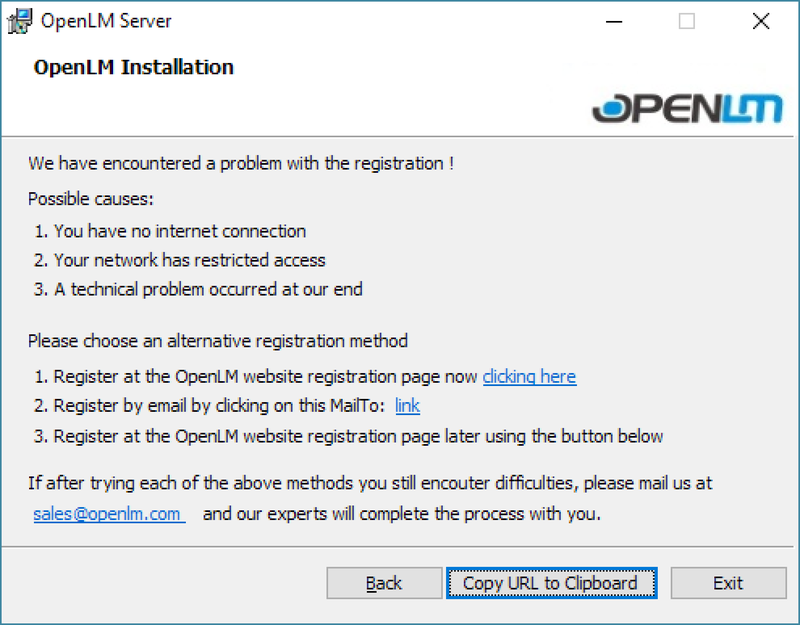 OpenLM Installer will detect when most issues occur with an installation/registration. A help screen will appear with suggestions, options and links. Most issues during installation will involve Internet connection or lack thereof. Checking your internet connection is the first action to pursue. Connection may be down, even temporarily, on either side of the transaction. Restarting the router is also an option. Links on the form provide several useful options. [CLICKING HERE] opens a URL with a web page that has a simple web form for entering and submitting your email address for response (See example screen below). Use the same email that was used when creating the registration. Entering the email address will create relevant license and download it to your machine when [NEXT] button is clicked. URL has encrypted information to ensure privacy. [COPY URL TO CLIPBOARD] copies the same encrypted web address so it can be transferred to another machine with Internet access if current machine is not set up for it. 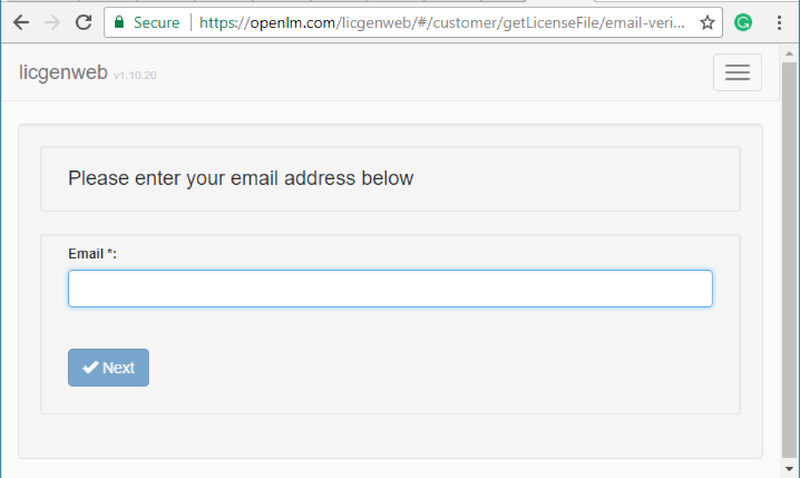 Clicking [LINK] on “OpenLM Installation” screen locates the default email client on current machine and creates an email containing ‘To’ address (sales@openlm.com), ‘Subject’ (Requesting a license file from OLM installer), and form data from the registration as the ‘Body’ of the email. Highlighted email address sales@openlm.com is information only. It will not kick off automated process initiated by clicking [LINK]. Clicking [BACK] returns the user to OpenLM License form. Clicking [EXIT] calls a confirmation screen warning that the user will be exiting the installation. Clicking [YES] on confirmation exits the installer without completing the registration. Clicking [NO] returns the user to “OpenLM Installation” screen. Should you decide to upgrade to standard licensing to take full advantage of the software and avoid service interruption, do so by contacting our sales team via email (sales@openlm.com) or use the form on website: https://www.openlm.com/contact-sales/. Users of the Core Trial version will be prompted for upgrading or continuing with the Light version after the 30-day trial period expires. Software can be uninstalled only after successful installation. All versions follow the same steps for uninstalling. Double click on the installer file used to begin installation of the software. “Setup Wizard “ will appear. 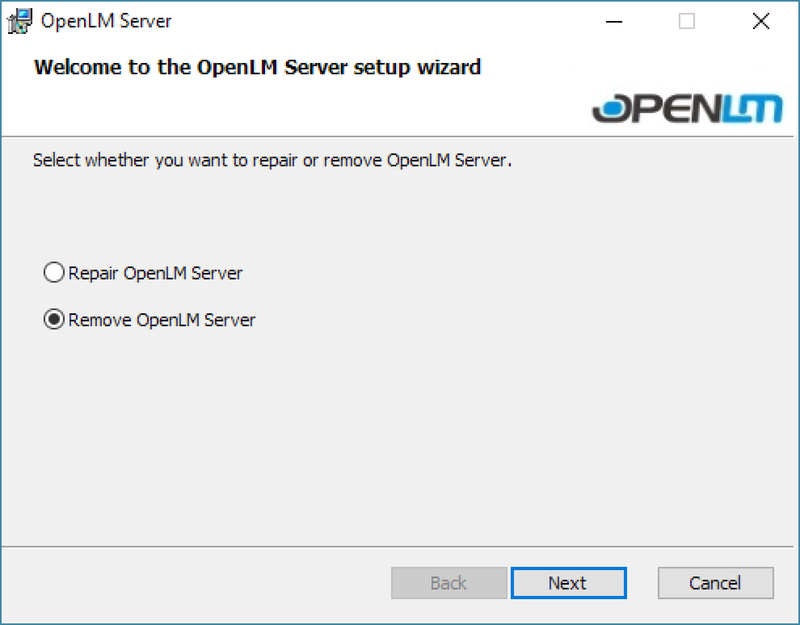 Choose “Remove OpenLM Server” as pictured. 3. Click NEXT. “Remove OpenLM Server” screen will appear. 4. When the process of uninstalling is completed, a confirmation screen will appear saying that the software has been successfully uninstalled. 5.Click CLOSE to complete the process. The installer does leave several folders in the system located here by default: C:\Program Files (x86)\OpenLM. Some of them contain license, log and database files. They will have to be manually removed from the system to be completely uninstalled.